When Kadokawa originally revealed The Lost Child, the Shin Megami Tensei inspiration was immediately clear - a feud between Gods and Demons with humanity stuck in the middle. I have an affinity towards dungeon crawler RPGs and I enjoy the SMT franchise, so I was immediately curious about what The Lost Child had to offer. However, I couldn't help but be skeptical if it could successfully leave a lasting impression and might instead be a cheap imitation. The Lost Child begins when Hayato Ibuki, a newbie journalist for an occult magazine, is saved by a mysterious woman in a subway station. In this brief encounter, she hands him a mysterious gun-like relic called the Gangour, which has the power to capture and control demons. Soon after, an angel, Lua, descends from heaven to guide Hayato as the Chosen One, fated to save mankind in accordance to God's Will. The Lost Child is a dungeon crawler through-and-through, with some minimal visual novel elements. Hayato's home base is found at the offices of LOST, the occult magazine he reports for. Here, various memos are posted on the bulletin board, where people relay strange occurrences or phenomena that don't seem to have an otherwise logical explanation. These memos are essentially your quests - both the mainline needed to progress through the game as well as side activities that might reward you with items or other bonuses. Once you accept to investigate some memos, you can visit various regions in and around Tokyo to speak with NPCs about these various strange occurrences. There's really nothing to this; you simply select places to visit from a menu and then select characters to speak to from another menu. Then, when you've spoken to enough NPCs, Lua will chime in on which Layer you need to enter to solve whatever the problem may be. Layers are The Lost Child's name for dungeons - the explorable areas that you'll navigate in this first-person dungeon crawler. Within these Layers, you'll run into a plethora of Astrals - the collective term for demon, angel, and fallen angel creatures. Using the Gangour, Hayato can tame almost any creature to fight at his side. Your battle party is made up of Hayato, Lua, and three Astrals throughout the course of the game. You can also hold some Astrals in a reserve party to switch into the battle party at any time. 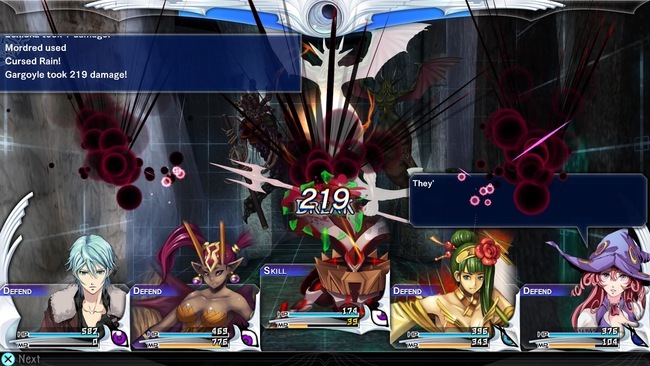 As is pretty usual for the genre, combat is done in a turn-based fashion, where the player selects the abilities that each party member is to use, and is then carried out in sequence before the enemy turn. Hayato and Lua gain EXP for battles, and upon each level-up, the player can choose which stats to distribute new points too. Lua is a healer and a magician, so I most always put her stats into magic, but she can also pack a punch physically, too, if you wish. Battles are pretty straightforward overall, incorporating a typical element advantage system. Besides the expected turn-based mechanics, a Burst Gauge sits at the top of the user interface, slowly filling as the player vanquishes foes. Using this Burst Gauge, Hayato can use an Astral Burst combo technique to deal a higher amount of damage. If this special attack manages to deplete the HP of the foe, then they are captured and can be summoned to your side. With three different difficulties levels that can be changed at any time, you can decide to challenge yourself or breeze through combat however you wish. Unlike Hayato and Lua, Astrals do not gain EXP in battle. Instead, the player earns three types of karma throughout the game. These three karma types represent each category of Astrals: demons, angels, and fallen angels. By feeding Astrals the proper karma, their level and stats will be boosted. Additionally, when an Astral's level meets a maximum, they can then be "EVILved" into a newer, more powerful Astral - although their level reverts back to 1. It's like a mix of Pokemon and Shin Megami Tensei, in a way. While the combat and Astral mechanics in place are functional, I can't help but feel that almost every facet of The Lost Child feels particularly typical or bland. The gameplay loop is drab and repetitive, and there's nothing new or interesting to experience here. With the exception of the final Layer of the game, most of the dungeon design is also quite dull - both aesthetically and logistically. Even most of the creature artwork and soundtrack offerings are unimpressive. The whole game simply feels stale. Story elements also leave a lot to be desired, and from a fairly early stage, it was easy to predict how the plotline would unfold. 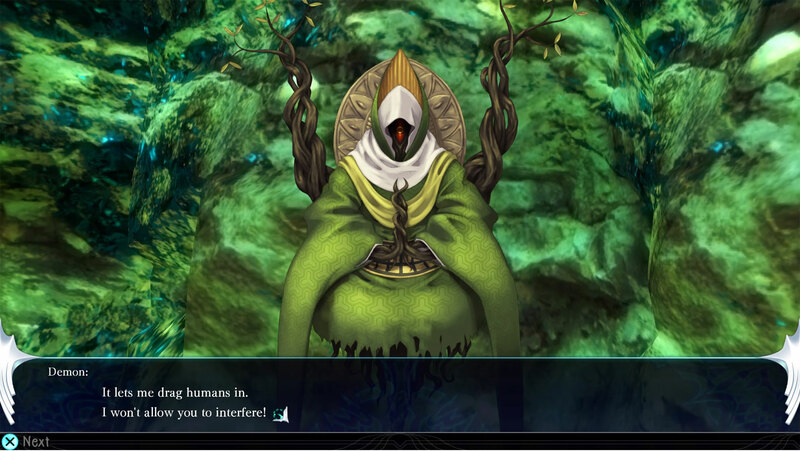 It ultimately feels like a watered-down version of Shin Megami Tensei, with beats you've likely experienced before in several other Japanese RPGs. I kept waiting for some twist or hook to take place to latch me onto the characters or narrative, but that hook never came. Everything trods along in expected fashion and eventually concludes with a whimper. 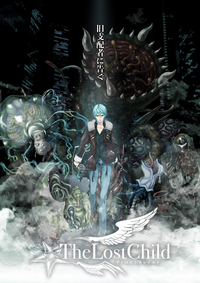 Kadokawa borrowed ideas from other games in the genre but failed to incorporate anything to allow The Lost Child to stand out on its own. 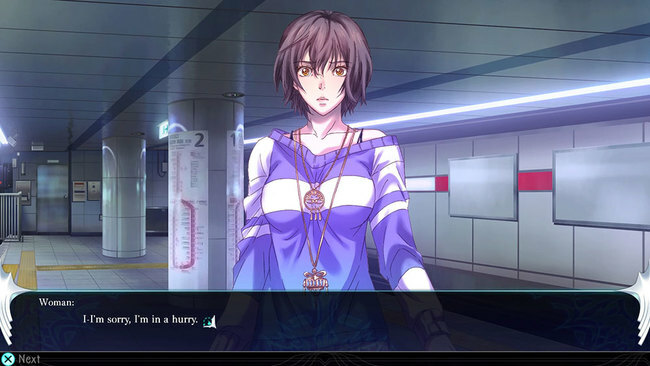 As a final note, you may have heard that The Lost Child is a sort of spinoff to El Shaddai: Ascension of the Metatron, a 2011 action game developed by the now-defunct Ignition Entertainment. 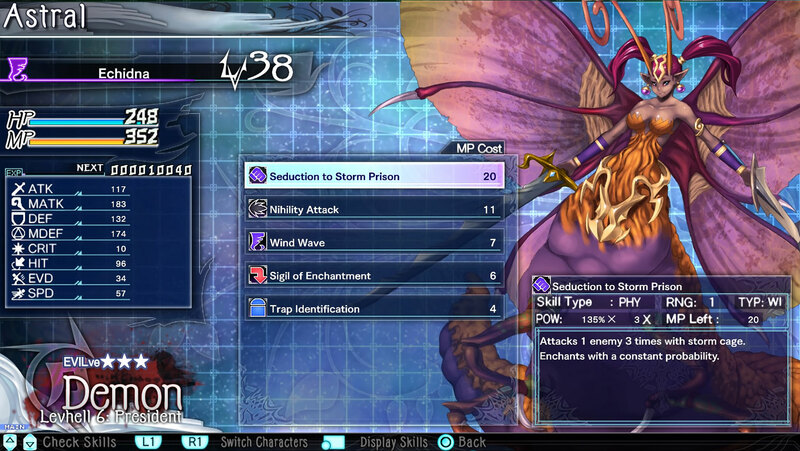 Indeed, a couple characters from El Shaddai do make an appearance - most importantly Enoch and Lucifel. I have not played El Shaddai, so I cannot fully explain the connection between the games, but The Lost Child certainly does not require previous knowledge to play. In one small chapter, Lucifel - an angel who has the power to manipulate time - initiates a sequence that feels like a nod to those who are familiar with these characters, but doesn't leave newcomers confused. There's nothing inherently broken about The Lost Child's mechanics or narrative, but there's also nothing compelling about them either. Ultimately, The Lost Child is just a gravely tepid dungeon crawler with nothing interesting to show. Check it out if you love the genre and are simply curious what's on offer here, but this RPG is easily skipped.